What is Geocortex Web Viewer? 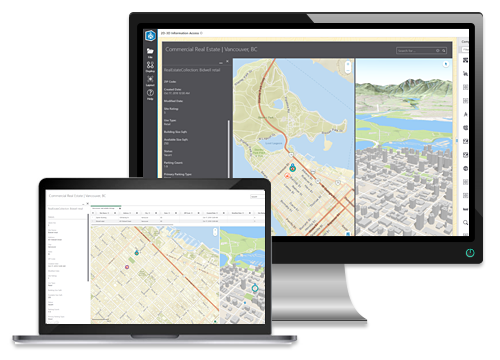 Learn about Geocortex Web Viewer and how you can use it. Take a tour of Geocortex Web Viewer Designer. Follow a step-by-step guide to create your first Geocortex Web Viewer app. View a list of component settings you can configure. The demand for 3D applications continues to grow. Geocortex Web Viewer combines 3D and 2D views into a single, beautiful end-user experience. Conforming to corporate brand guidelines or configuring multi-map applications with components where you want them; Geocortex Web Viewer is backed by a new configuration schema with unprecedented layout flexibility. A live preview of your application for instant verification of configuration changes, multi-monitor support, enhanced mechanisms for locating configuration of interest; Geocortex Web Viewer Designer takes the configure-first paradigm even further. Built-in support for managing applications and their dependencies through development, test, staging and production. Geocortex Web Viewer is faster due to Asynchronous Module Declaration (AMD) and Webpack optimization; ensuring clients download only the content required. More governments are requiring that public facing apps are Section 508 / WCAG AA accessibility compliant; Geocortex Web Viewer gives you out-of-the-box compliance.